Phnom Penh (VNA) - Cambodia celebrated the 62nd Independence Day with a grand ceremony at the Independence Monument in Phnom Penh on November 9. The event was attended by Cambodian King Norodom Sihamoni, National Assembly President Heng Samrin, Prime Minister Hun Sen, and Senate President Say Chhum. It also saw the presence of other senior officials and representatives of political parties, civil organisations and diplomatic corps, along with tens of thousands of Cambodian people. 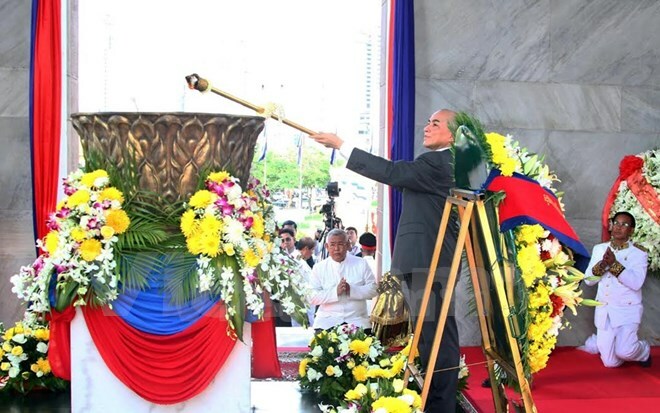 King Sihamoni laid a wreath and lit the victory torch to commemorate heroes and martyrs at the Independence Monument. Under the leadership of the late King Norodom Sihanouk, Cambodia gained its independence on November 9, 1953 from French colonialists who ruled the Kingdom from 1863.